Venetian hotel is an ideal place for a wedding, especially for those with a fascination for the charm of old world Italy. Known for its elegance, the Venetian's three locations for wedding ceremonies uphold this reputation. Naturally, you can choose for your ceremony to be held in the chapel. 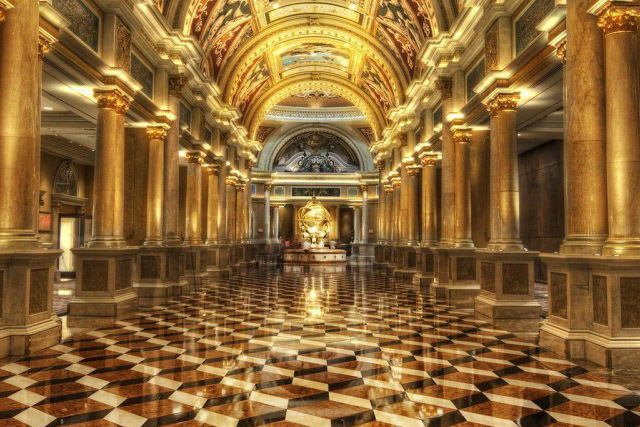 The Venetian is equipped with three chapels, each of which accommodate between 40-50 guests. They can be combined to accommodate up to 150, depending on how many guests you have. The other two ceremony locations the Venetian offers are the Ponte al di Piazza bridge over the Grand Canal and in a gondola. The bridge is not only beautiful, but is also architecturally symbolic of progress and advancement. The gondola is a picturesque symbol of Italy and of romance. The Venetian realizes that the success of a wedding is all in the details, and therefore offers guidance while you select floral arrangements, catering options, and other components of ambiance. Your perfectly designed wedding awaits at the Venetian.